The race started with a huge barrage of fireworks as thousands of runners walked/jogged toward the start line. Thanks to great corral placement, I crossed the start line only 2 minutes after the gun. Jodi and I ran together for a good while. With so many people and so much interaction along the way the early miles seemed to fly by. Jodi and I talked like long lost friends as both of us marveled at the size of the field, the music, the support. I now realize that I started out too fast. I should have been running at least 30 seconds a mile slower to conserve energy for later in the race, but in the pre-dawn hours the weather was great, I felt strong, and the running came easy as Jodi and I ran and chatted along the course. The Disney marathon takes runners through all four parks and near several resorts, and it seems designed to provide stimulus and support just when you need it. You’ve gone about 10 miles when you enter Magic Kingdom and run down main street and through the castle and back out. A few miles later you enter Animal kingdom, then Hollywood Studios, then Epcot in the last 2 miles of the race. When you’re not in the park, there are DJ’s and remote hosts with mics and chip readers calling out passing runners’ names. No need for iPods as you hear music all along the way, since you often pass either live bands or speakers wired to play all kinds of music, but mostly classic 70s and 80s rock, it seems. Water stations and food stations are numerous, and appear every mile after the first 8 or so miles. In the parks and along the road cast members cheer you on, along with family and supporters. You can have photos made with Disney characters in the parks, and many people stopped to do so. Like a festival along a marathon course it was a lot of fun. Along the way I used my cell to keep my wife abreast of where I was in order that they could find me. I also used twitterphone to update on twitter. Jodi and I also called into the extra Mile podcast and I called into my call-in number that produces .wav files for me to put in the podcast. I ran a pretty speedy half for me, 2:50 through 13.1. This is faster than I should have run, but like I said, I felt great and the pre-dawn temps were comfy. As we left the Magic Kingdom and reached the half-way point, the sun was up and temps began to rise. All week I had kept a close eye on the weather forecast, which looked, early on, like perfect weather: 45-65 and partly cloudy. But as race day grew nearer, temps trended up and Sunday became the warmest sunniest day of the week. If only Frozone could’ve frosted me a little. I asked him to, the fraud. The high for Sunday was forecast for 80 degrees F. It wouldn’t reach that until after the race had ended, but the sun was really blazing. Mind you, all my training was between the hours of 5-7 am this fall, with the exception of Sunday mornings. But Alabama has had a pretty cool fall and my long runs came on days that were cool, if not cold. So the sun ate me alive. Couple that with my quick pace in the first half and by mile 20 I was pretty worn-down. I went to a run-walk pattern that became a little more walk as the miles passed by. By mile 20 I could still have finished in under 6 hours had I been able to keep my pace, but even though my nutrition and hydration were fine, the sun was sapping me. So I endured–it is an endurance race after all–until the end. 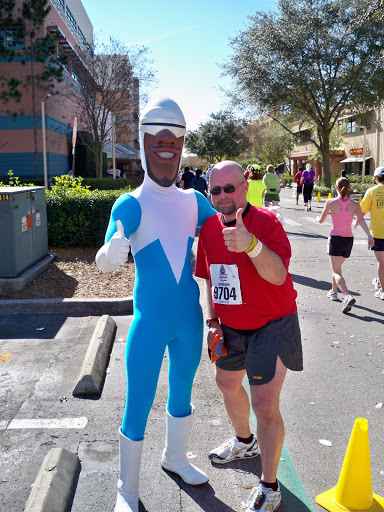 When I got back to Epcot fo rthe last mile or so, I began running again consistently. The course took us into Epcot and around the World Showcase, starting at the United Kingdom and traveling counterclockwise until we arrived at the big sphere–Spaceship Earth–and out a side gate to the finish. Before you round the bend to the finish area the last entertainment you see is a wonderful gospel choir who sang beautifully and lifted my spirits. As I turned the corner, I began the last .2 miles to the finish. I was in tears. My thoughts turned to my family, my training, all the months thinking about this event, the questions about whether I could actually pull this off, the doubts, the imaginings of what this moment would be like. It was greater than I had ever imagined. My pain and fatigue faded away, my pace quickened. My heart raced, and I wept. I saw the crowd in grandstands to my left and race officials and personnel to my right, they were cheering wildly for all of us finishers and I couldn’t help but let the tears flow. I scanned the crowd for my family but did not see them. I passed the finish line with my arms raised triumphantly as if I had won. See, I had won. I had won my race against the marathon. I had won a personal victory for myself in achieving a goal that I could never have imagined two years ago. One year ago, my long runs were 5 miles. Now I had done 26.2. Just after crossing the finish, I heard my wife and kids yelling for me. I broke down as we embraced through the fence. I cried loudly that I had done it, that I loved them. My young sons don’t quite understand tears of joy. My oldest kept reassuring me to “don’t be sad, daddy.” I told him that I was as happy as I’d been in a long time. I got my medal, had my medal photo taken, retrieved my bag from bag check and then met my family in the reunion area. We chatted for a few minutes and hugged some more. I told my boys that a voice mail they sent me in the middle of the race made me run faster. My oldest son had called and left a simple message: “Go daddy go. Go daddy go.” I lost it then and I lost it again. I told him how much his words meant to me and we both hugged and cried together. 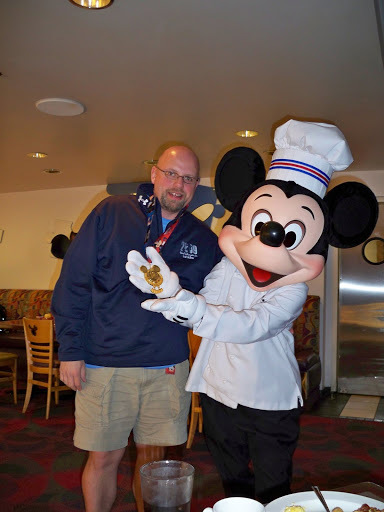 It is a custom among Disney Runners to wear one’s medal in the parks that night and often the next day. I did just that. I had my race t-shirt and my medal. People I had never met, who likely would never attend an endurance event, stopped me and offered congratulations. I caught the eyes of fellow marathoners and we shared knowing glances and nods about our post-race hobbles up and down and streets of the Magic Kingdom. It was an awesome feeling being able to continue celebrating this feat well into the night. If you’d told me two years ago that I would run a marathon, I would’ve told you you were nuts. In fact, my brother-in-law, himself a marathoner, had put forth the question soon after I started running in 2007 and I shot down the idea as something I’d never consider. Now I had actually done it. I’ve run to Disney. How about we do the Goofy Challenge in 2011????? Gotta have a reason to keep the blog/podcast going, no? 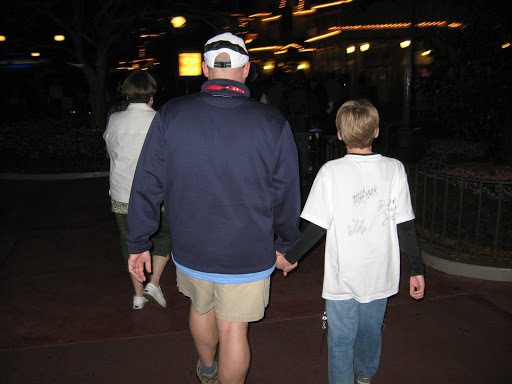 My son and I walking out of Disney on our last night there. We both cried. amazing special moments you shared with your son. Congrats on your accomplishment! You’re a marathoner! Gordon, I could completly relate to everything you said as I experienced the exact same emotions even with the family. I cried when I hugged my wife at the end. The kids were sending text saying “ur a beast Dad”. Hopefully I will be there next year. I am updating my blog as well, hope you get a chance to read it. Wow, what an AWESOME race report. I was wondering how the rest of the race went for you. This report makes me wanna cry! I’m sorry about starting out too fast. What an inspiring story. If this doesnt encourage others to run their first marathon, I don’t know what will! I’m sure your family is very proud. I’m not such a great writer, so my report will be on my podcast. Congratulations on completing your first marathon! !Glad you enjoyed the race and visit to Orlando. Weather in Central FL is very finicky and wouldn’t you know it, it’s pretty cold this weekend. But you finished and that’s all that matters. Enjoy your recovery — you earned it!! Absolutely excellent! Gosh I wish I could make it in 2011 — but I’m afraid my little Isaac will be to small to remember it.I am so darn impressed with you, Gordon. I’d love to make it to Alabama one day to run with you, you marathoner! Great job, Gordon!!! We’re unspeakably proud of you. 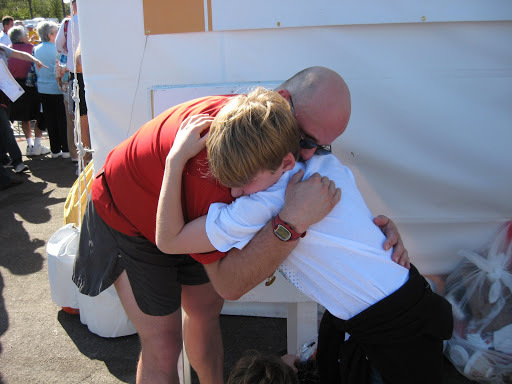 What an accomplishment!The 5 from VA.
great race report – I know exactly how you feel…that weeping at the end. NOTHING compares to completing the first marathon – and for you after so much anticipation (almost 2 years).See you back at Disney! Great report, congrats on your finish, savor it for awhile and then start planning your next one. Thanks for the info on the Disney Marathon. I'm planning on running it in 2011 and MAY do the goofy challenge! I'll probably be asking you info about where to stay, etc. later. gordon, congratulations! 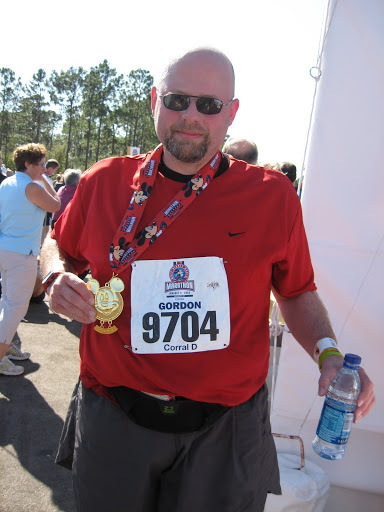 i'm reading this post in preparation for running the 2010 disney marathon in just 4 days!!! i'm both nervous and afraid to fail, it's my first marathon.